Is Honeywell Germ Free Cool Mist Humidifier HCM350 The Best Humidifier For Babies? Babies’ nasal canal and skin are more sensitive, hence the need for a humidifier to fight off the harsh effects of dry air. A humidifier adds moisture to the air by producing a mist. While it is especially important in the winter months, it is actually a good idea to have a humidifier for your baby in the nursery. If you’re new to humidifiers or you’re still considering whether do you really need a humidifier for your baby or not, let me share with you the benefits and risks of having one, as well as how to choose the right humidifier for your family. I used to think it’s just a simple device until I had to shop for one myself. Alternatively, you can jump straight into our in-depth review on the Honeywell Germ-free Cool Mist Humidifier. Why Should You Have A Humidifier in Your Baby’s Nursery? Is A Warm-Mist Humidifier or Cool-Mist Humidifier Better for the Baby? What is the Optimal Level of Humidity in Your Home? How to Choose the Right Humidifier for Your Baby’s Nursery? 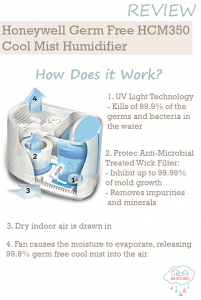 How does the Honeywell Germ Free Humidifier Work? How to Clean the Honeywell Humidifier? How to Clean the Honeywell Humidifier Filter? When do I Change to Honeywell Humidifier Filter? How to Refill the Honeywell Cool Mist Humidifier? How to Clean the Honeywell Cool Mist Humidifier Fan Blades? How to Use the Honeywell Cool Mist Humidifier? What Options are Available for the Honeywell Cool Mist Humidifier? Is the Honeywell HCM-350 Germ Free Humidifier Noisy? The hot and dry indoor air in winter parch the nose and throat, which makes the membranes lining the throat and nose more irritable and lower the resistance to germs. As a result, our little ones become even more susceptible to infections and illness. You’ll notice that babies fall prey more frequently and easily to sore throats, sinus, congestion, colds and coughs in the cold months. A humidifier can help introduce the much needed moisture to the air so that the humidity of the indoor air is at a comfortable level for breathing. The moist vapor from the humidifiers can relieve cold symptoms and congestion by helping to loosen the mucus clogging the nose, throat and chest. This helps babies to breathe and sleep better, recover faster, and prevent a cold or infection. Babies’ skin is very sensitive. Dry air can irritate their skin, resulting in dry, red and patchy skin, and chapped lips, as well as worsen chronic skin conditions, such as eczema. Humidifiers help to increase the moisture in the air, keeping the baby’s skin smooth and soft. This is especially so during the winter months or if you’re staying in a dry climate. The humming noise produced by the humidifier as it releases the mist is a form of white noise that can help lull the baby to sleep. If your baby is having difficulty sleeping, you can even save on a white noise machine if you already have a humidifier on. Studies have shown that survival of influenza virus in the air and on surfaces is lowest when the air is at relative humidity levels of between 40% and 60%. Portable humidifiers can help to maintain the moisture level of the indoor air at home in this desirable range. Both types of humidifiers are equally effective in adding moisture to the air. However, both have their pros and cons. Depending on the situation you are in, one may be preferred over the other. In general, cool mist humidifiers are often recommended when used for young children because warm mist humidifiers can potentially turn into a potential safety hazard – burns. Cool mist humidifiers, on the other hand, are more prone to mold and bacteria growth in the water reservoir/humidifier if not well cleaned. Also known as steam vaporizers, warm-mist humidifiers boil the water with a heating element to release hot steam into the air. They are quieter, less expensive and less likely to break down due to its simplicity. They also tend to make the room feel warmer so you can lower the heater. As they do not require a filter, cleaning of the warm mist humidifiers is generally hassle-free. Due to the process of boiling the water, up to 95% of bacteria, mold and spores in the heated vapor are killed. Vaporizers such as The Vicks V150SGN Warm Steam Vaporizer, is ideal if you intend to use it to produce medicated vapors. It can be used with Vicks Vaposteam, VapoPads and Kaz Inhalant to provide soothing relief from cold and cough symptoms. This Vicks Warm Steam Vaporizer also features safety features such as the auto-shut off function that is activated when the water reservoir reaches a minimum level, a night light to avoid knock-overs at night, and patented steam safety vents to regulate vapor flow to prevent over-boiling and splitting. The design is also easy to clean, and the carbon electrodes used will not rust and do not require frequent cleaning. The biggest risk of using a warm mist humidifier is the potential for burns because it makes use of boiling water. Young children may be scalded and injured if the humidifier spills or falls, or should they put their hands and faces directly over the nozzle. The combination of moisture and heat provide a good breeding environment for mold. Important: You should only use a warm-mist humidifier if the unit can be placed in a safe place that is completely out of reach of the young children and also ensure that the kids are unable to get hold of the cords to pull down the units. It may be dangerous if you have a toddler, who is at a stage where they are very active, curious and may not follow instructions. Cool mist humidifier uses only cold water to release a cool or room-temperature mist into the air. Pros – Eliminates the safety risks associated with warm mist models. Cons – If not regularly cleaned, they can be a breeding ground for mold and other micro-organisms. These air-borne pathogens, when inhaled, can be harmful to your child’s health. There are 2 types of cool mist humidifier – Ultrasonic and Evaporative, which differs in the way they produce the cool mist. Ultrasonic humidifiers use high-frequency sound vibrations to break water particles into a cool mist. Pros – They are quiet, efficient, compact, and consume less electricity. Cons – They are more expensive and have a higher tendency to breakdown. As they do not make use of filters, the minerals present in the water (especially with hard water) are collected and released as fine white dust, which often form a layer on the furniture. Using distilled water can help to avoid the production of the white dust. Not only can the white dust be a nuisance to clean, there was a case of a young infant suffering from inhalation lung injury associated with the ultrasonic humidifier “white dust” reported in the January 2011 Pediatrics Publication. Evaporative humidifiers make use of fans to evaporate water through a saturated wick (filter). Pros – As evaporative humidifiers make use of filters, the minerals and impurities are retained. Hence, it does not lead to the production of the fine white dust like the ultrasound models. Cons – Among the 3 types of humidifiers, these are the noisiest, bulkiest, and the most energy-consuming design because of the fans. Evaporative humidifiers which use permanent filters require frequent cleaning of the filters, while models that make use of replaceable filters require regular replacement of the filters (which means added cost). The optimal indoor relative humidity (RH) levels should be kept around 40%-50%. RH levels below 30% would be considered too dry. EPA recommends indoor RH to be kept below 60% as too much moisture in the air can lead to mold growth and proliferation of dust mites. You can easily measure the humidity level in your home using a hygrometer, which cost less than 10 bucks. 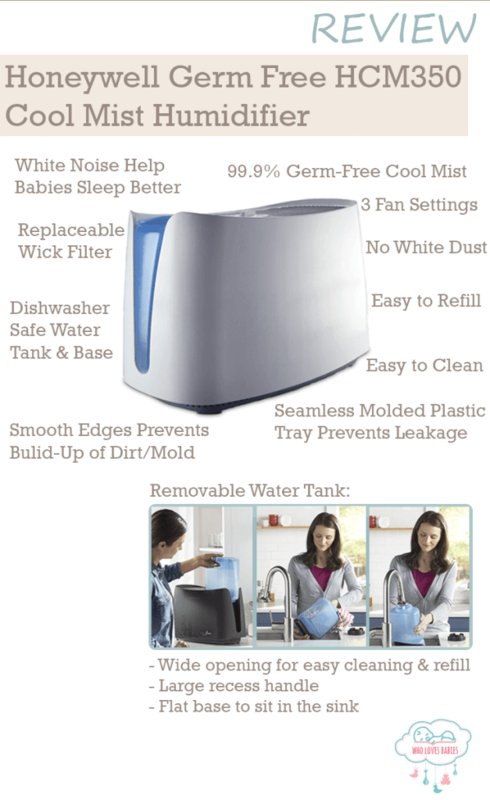 One of the most important factors to consider when choosing a humidifier is the ease of use and the ease of cleaning. A dirty humidifier can do more harm than good, as it can be spewing out bacteria and mold constantly. According to tests carried out by Consumer Reports on the three types of humidifiers (evaporative, ultrasonic and vaporizer), it was found that none of the evaporative humidifiers emitted airborne bacteria and only 1 vaporizer do not. The Honeywell HCM-350 evaporative humidifier and the Vicks V150SGN vaporizer are identified to have minimal bacteria growth and no emission of bacteria into the air. 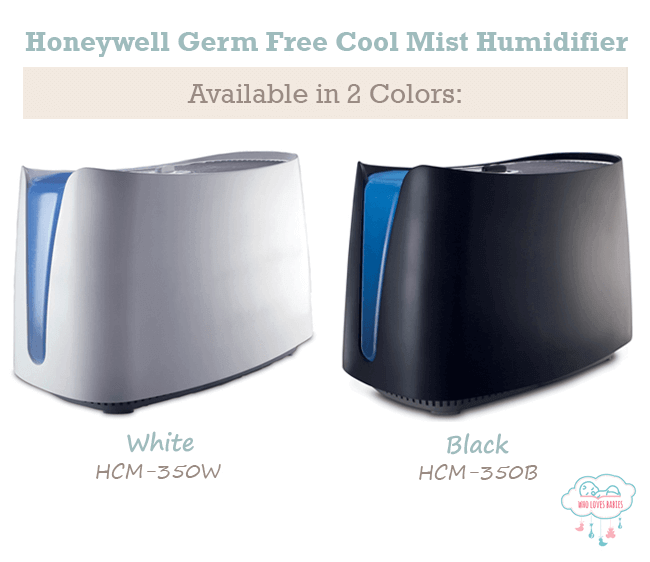 The Honeywell Germ Free Cool Mist HCM350 Humidifier is our recommended choice as it is very easy to clean and refill. As seen from the tests by Consumer Report, the Honeywell Germ Free Cool Mist Humidifier has minimal bacterial growth and no emission of airborne bacteria. It has anti-microbial features and is capable of producing 99.9% germ-free cool mist due to its patented germ killing chamber technology. Hence, you can now enjoy the same benefits of having more than 95% of bacteria in the mist killed as the warm mist humidifier, but without the safety risks of burn injuries. As it is an evaporative humidifier, you also need not worry about the fine white dust produced by an ultrasonic humidifier. Considering the quality of the Honeywell Germ Free Cool Mist Humidifier, this is a relatively inexpensive humidifier. Evaporative models are usually not the most powerful humidifiers, so you do not have to worry about over humidification or condensation of water around the humidifier. However, Honeywell is still very efficient for a medium-sized single room (around 400 square feet) use, bringing and maintaining the level of humidity at a comfortable level. It comes with 3 fan speed settings so you can select your desired moisture output and sound level. Water from the water tank flows is exposed to UV light technology to kill off 99.9% of the germs and bacteria in the water. The sanitized water then flows to the base tray and is absorbed though the wicking filter to further remove impurities and minerals. The Honeywell HAC504 evaporative wick filter has been treated with Protec antimicrobial to inhibit up to 99.99% of mold growth. The fan blowing over the wick causes the moisture to evaporate, and this 99.9% germ free cool mist is then released to the air. Using a humidifier means that you have to refill it every day and clean it very regularly. It is therefore a major plus point that the Honeywell HCM-350 Humidifier is very user-friendly. It is probably one of the easiest humidifier to clean by far. It is very easy to take apart for cleaning and set up afterwards. Simply remove the water tank, lift off the upper enclosure and there you are – the filter and water tray/base which are free of electronics. When you refill the water tank every day, you can carry out a simple cleaning routine of emptying, rinsing and wiping dry the base tray before refilling. A more rigorous cleaning of the humidifier is recommended on a weekly basis. The GOOD news is that both the water tank and base tray are top-rack dishwasher-safe (but not the tank cap). Honeywell recommends running on a light or normal cycle, at temperatures below 70°C/158°F. If you’re not using the dishwasher for cleaning, you will need to follow the descaling (with vinegar) and disinfecting (with bleach solution) procedures in the user manual or video below. I like that the humidifier has been designed with better hygiene and ease of cleaning in mind. The opening of the water tank is wide enough for you to extend your hand in it to clean the inside of the reservoir easily. There are no narrow nooks and crevices to maneuver around. The base water tray is a seamless molded plastic, which eliminates a common problem of leaking. Moreover, all the parts and edges are smooth and rounded, which make it more hygienic and easier to clean because there are no rough or sharp edges to harbor a build-up of dirt or mold. You will notice that the filter becomes brownish over time, but that’s just a build-up of mineral deposits. TIP: To ensure that the filter ‘age’ evenly, turn it over each time you put it back after refilling or cleaning. In the meantime, it is simple to clean. Simply remove the filter from the base, soak it in cool water and place the wet filter back in. Important: Do not wring or squeeze dry the filter! Honeywell recommends to change the filter every 30 to 60 days. It’s not difficult to tell when it’s time to replace the filter. If you notice that the humidifier is not as efficient as it used to be (e.g. you are left with more water in the tank or the room does not feel as humid), the filter is getting stiff and encrusted, or if the filter is giving off an odor, it’s probably time. Using distilled water instead of hard water/tap water, may increase the filter lifespan. The Honeywell HCM-350 Cool Mist Humidifier series make use of the original Honeywell HAC-504AW replacement filter (also known as the Honeywell Filter A pad). Be sure to get the right one. When purchasing your replacement filter online, be aware that there are also many other brands making compatible filters. Simply remove the tank from the unit, and turn it over to remove the tank cap. The base of the water tank is flat and the tank size is small enough for you to leave it to sit in the sink to refill. If you refill by pouring water from a pitcher instead of from the tap directly, the opening of the water tank is also very wide so it’s pretty easy to refill without causing a spillage. The tank size is roughly a gallon. If you’re operating the humidifier on the lowest fan setting, each filling can last 24 hours, so there’s no need to wake up in the night to refill again. If you’re using the highest fan setting, you will probably deplete 2 tanks in a day. I realized that there are many customers who have this same question. Unfortunately, there isn’t any instructions in the Honeywell user manual on how to clean the humidifier fan blades. Over time, the fan blades can get dusty. However, it is not easy to access and clean the internal fan blades due to the narrow grill-like openings on the top cover. You might want to try using canned air, portable cable air compressor with a blow gun attachment, or vacuum cleaner with a brush attachment. It’s probably easier to clean it periodically before you notice a thick layer of dust gets accumulated. There’s a youtube video showing how to use a flathead screwdriver to pry open and remove the top cover to clean the fan blades directly. However, I wouldn’t recommend that as this might affect your warranty. Place it on a firm, level, and water-resistant surface, and away from any heat source. Ensure that the humidifier is at least 5 – 12 inches away from the wall to ensure proper airflow, and check that the wire is not a tripping hazard. The mist from the humidifier should be evenly distributed throughout the room and not directed at the baby’s crib, furniture, or the walls. Check that there should not be moisture on the furniture and the carpets, curtains, beddings, and the walls are not becoming damp, as excessively high humidity not only damages furniture but also promotes mold growth. To set up the Honeywell HCM-350 humidifier, remove the water tank for filling. Lift off the upper enclosure and remove the filter. Soak the filter in cold water and place the wet filter back in position. Reassemble the enclosure on the base, and replace the tank that has been filled with cold water. Make sure that the unit’s fan setting is switched off before plugging into the electric outlet. You may now turn on and adjust the fan settings. TIP: For the humidifier to function efficiently, remember to soak the new filter in cool water first before placing the wet filter onto its position on the base tray every time you change your filter. Different kids react differently, so you’ll have to watch your child’s breathing patterns and adjust the humidity levels or fan settings. If you find that your child is showing signs of breathing discomfort, it could be that the humidity settings are too high or there could be dirt or germs. 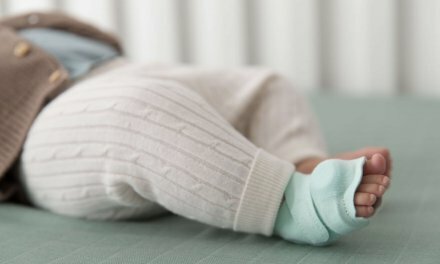 If you realize that your baby is having recurring colds or coughs after the use of the humidifier, you might want to disinfect the humidifier, change the filter, and also check with your paediatrician in case of an allergic reaction due to micro-organisms that the humidifier is spewing out. It is advisable to disinfect the humidifier and change the filter when a family member is down with respiratory infections, or even better, ensure that he/she stays away from the baby and the baby’s nursery as the micro-organisms may find its way into the humidifier. Always remember that a baby’s immune system is not fully developed yet, hence they are much weaker compared to a normal child and adult. This model is available in 2 colors – White (as denoted by the model HCM350W) and Black (HCM350B). It is relatively bulky, measuring 10.39 x 18.58 x 13.03 inches. The use of a disposable filter that needs to be replaced periodically means that this is an additional cost that you need to factor in before purchasing. However, I still prefer humidifier models with replaceable filters as the effort to clean the filters are minimal. Permanent filters, on the other hand, may require more rigorous cleaning routine or may require more expensive professional help and replacement, should anything go wrong. Honeywell’s replacement filter costs around $10, and you can use it with tap water (so you can save on distilled water too). Auto shut-off function when the water level reaches a minimum level or when a desired level of humidity is reached. A built-in hygrometer and adjustable humidistat to measure and maintain the humidity in the room at the desired level. As with any evaporative humidifier, it makes use of a fan so it is noisier compared to other types of humidifiers. However, this fan blowing noise is also a form of white noise. When using the Honeywell HCM350 Humidifier in a nursery, this white noise produced is actually beneficial as it can help soothe and lull the baby to sleep, rather than interfere with their sleep. While there are complaints by some customers that they find this Honeywell Germ Free Humidifier too noisy, most would agree that the sound from the lowest fan setting is very acceptable. Once you’ve decided which humidifier to add to your baby’s nursery, it’s best if you can discuss with your paediatricians especially if your baby has existing conditions such as asthma and allergies. When you start using the humidifier at home, it is SUPER IMPORTANT to be diligent about cleaning it. It is definitely not for the low maintenance minded parents. Cool mist humidifiers can be a very handy device to add moisture to the room to make your baby breathe and sleep more comfortably, but it can be spewing out mold, fungus and bacteria unknowingly, if you’re not careful. Hence our recommended humidifier is the Honeywell Germ Free HCM350 Cool Mist evaporative humidifier because it features patented technology to minimize bacterial growth and emission, and it is one of the easiest humidifier to clean.